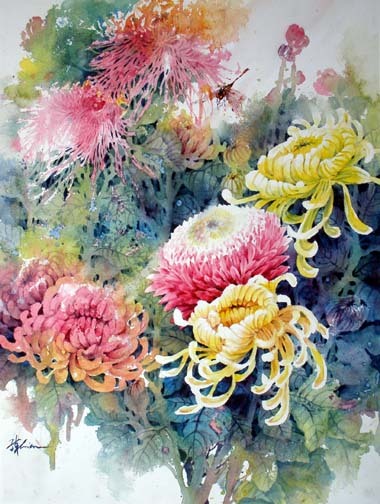 Lian Quan Zhen is a popular watercolor and Chinese painting artist and teacher in the US and abroad. He is one of the most popular authors of North Light Books that has published three of his books as shown bellow. 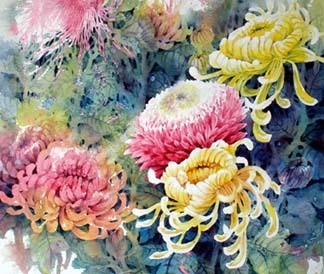 His art teaching credentials include at the University of California at Berkeley where he taught watercolor outdoor sketching for 8 years; watercolor and Chinese painting workshops nationwide in US, Europe, Canada, Mexico, Bahamas, China, South Africa and Australia. Also, Lian has been an invited juror for California, Colorado, New Mexico and Kentucky Watercolor Societies’ exhibitions and other local shows. 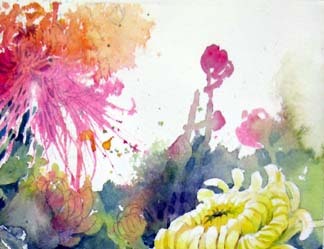 His paintings featured in magazines such as Watercolor 94 Spring, Splash4, Collectors (Hong Kong) and books of Landscape on Watercolor (UK), Finding Your Visual Voice and Painter’s Quick Reference books by North Light Books: Flowers and Blooms, Dogs and Cats, Birds and Butterflies, Landscapes and Drawing and Painting Animals – the Essential Guide. 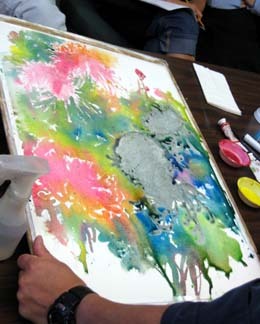 Materials: use watercolor painting materials listed at the bottom of the Workshops page on this web site. 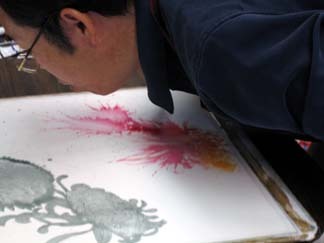 Preparation before painting: Put the three primary pigments into three small dishes separately and dilute them with water to make color liquids about medium tone. 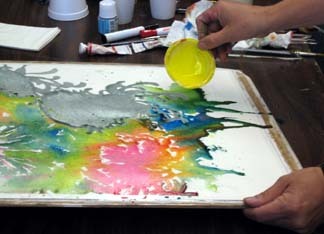 You need approximately 7 teaspoons of color liquid from each color to finish this painting. Sketch the composition on the watercolor paper with pencil. Use masking tape to attach the perimeters of the paper on a firm board. 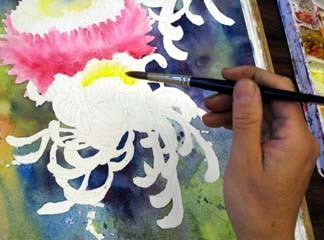 Next, use masking fluid to cover the three flowers at the focus point. 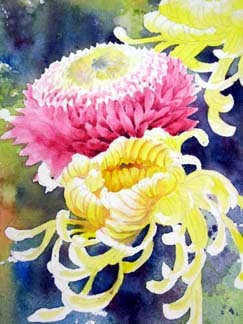 Pour the Yellow and Red liquids on the upper left of the painting and use mouth to blow them in forming the shapes of the flowers. 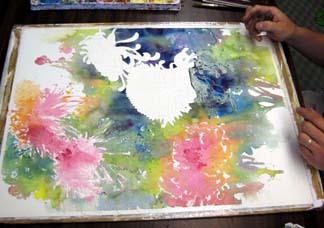 Pour the Yellow and Blue liquids next to the flowers. Use fingers to guide and blend the colors. Avoid over-mixing the liquids. 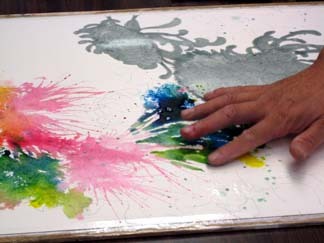 Pour more color liquids on the painting and paint with similar method as step 3 using fingers and large brushes. Tilt the upper edge of the board about 4 inches higher so that the liquids can flow down toward the bottom to create the stems. 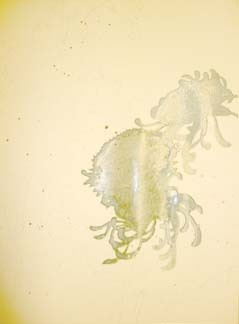 Here you can see the whole painting after pouring and blending. While the painting is wet, use a large brush to mix thick and soft Blue and Red pigments into dark Blue to paint around the flowers. Wait until the painting completely dry. Use masking tape to lift the masking on the three flowers. 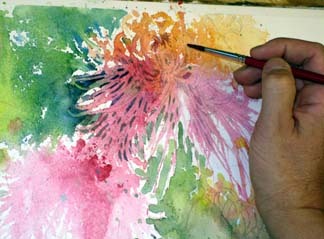 Use a pencil to sketch the details of the flowers again if the original sketching disappears. 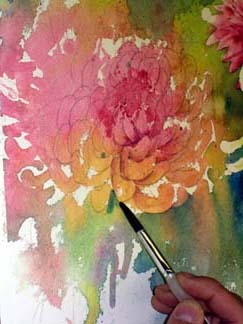 Take two mid-size round brushes to paint the flowers, one for apply colors and the other for blending. 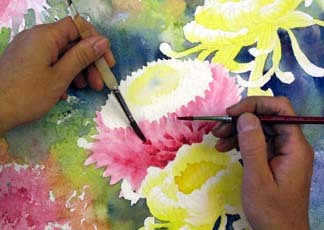 After for the first layer of the colors dry, use two small size brushes to defined the petals, one for apply colors and the other for blending. To mix dark red use the soft and thick Red and a little Blue. To mix orange use the Red and Yellow. When defining the petals, measure not to paint every one of them with same intensity of colors, nor same level of details. 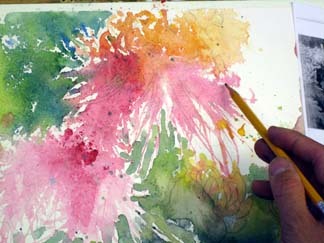 At the upper left of the painting, use a pencil to draw the shapes of flowers, improvising from the effects of the color pouring and blowing. 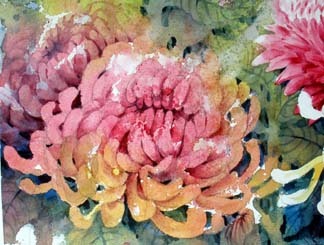 Then use negative painting technique to define the petals. 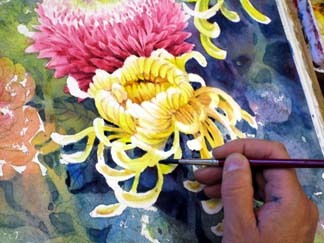 Repeat the techniques on step 10 to call out the flowers at the lower left of the painting. After finishing the flowers, paint the leaves and stems starting from the focus point area. Use two brushes to define the objects with negative painting technique. Put more dark value colors mixing from the Blue and Red around the light flowers. Paint more detail backgrounds around the focus point area. Do not defined all the edges of the flowers in the same way. For those locate away from the focus point such as the flowers at the upper and lower left some undefined areas. 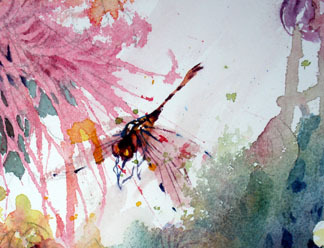 Add a reddish dragonfly on top of the painting. It gives more life to the flowers. On top of this page is the finished painting. Thanks for the steps. Nice! Great painting and great colors. Your pictures are so neat in how they show the gradual progression from blank canvas, to ugly blob, to beautiful flower! I wish I could paint like that. thank you Lian Quan Zhen. I am so happy to see your painting idea. i am a student of fine arts. i am so interest in watercolor. you flower study will help me for beter some things. very beautifu!!!! !lThe way its method is described is also wonderful..
this painting or adequate one.